I am so excited to share this fun project with you. I saw this idea on Pinterest a few years ago and loved it. 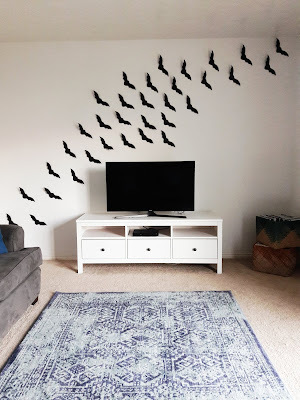 This year I finally got around to creating my very own bat wall! Print and cut out your bat stencil. Fold a piece of cardstock paper in half. Place the center of the bat outline on the crease. Using your pencil trace the outline onto the cardstock paper. Cut along the penciled outline. 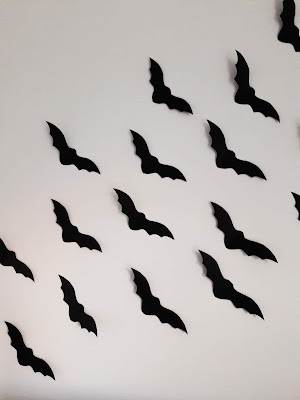 Repeat until you have as many bats as needed, I used 35. 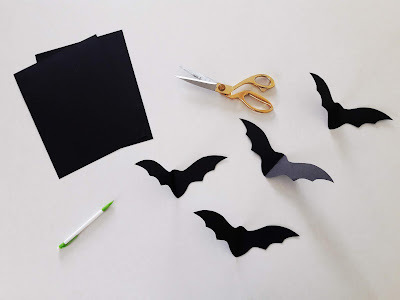 Place a piece of folded or double sided tape on the back of your paper bat. 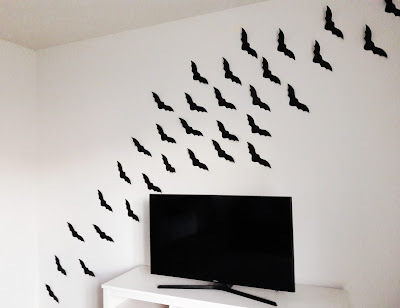 Arrange bats on wall in your desired pattern. During the fall we tend to spend more time in our family room gathered around the TV. There are Halloween movies and new TV shows to watch and with the nights getting shorter and colder snuggled up in front of the TV is our favorite place to be. I thought adding the bat wall right above it would be the perfect way to add a touch of spookiness to our nights in. The bat wall would work perfectly in any room. 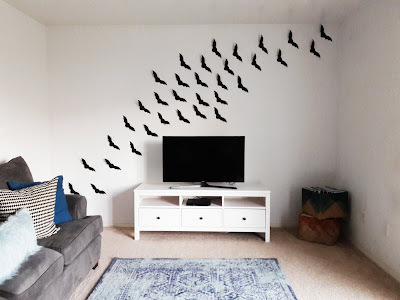 Above a bed in a bedroom, in your entry way to welcome guests or even above a table during those fun festive Halloween parties. Especially since it's so cheap and easy to create. I am so excited to enjoy this for the rest of the Halloween season. What fun decorations have you added to your home this year?